Mention “high school student restaurant” and the first thing that comes to mind is the restaurant of Oka High School in Taki, Mie Prefecture, featured in the television drama series “High School Restaurant.” But, did you know that such a restaurant also exists in Shiga Prefecture? 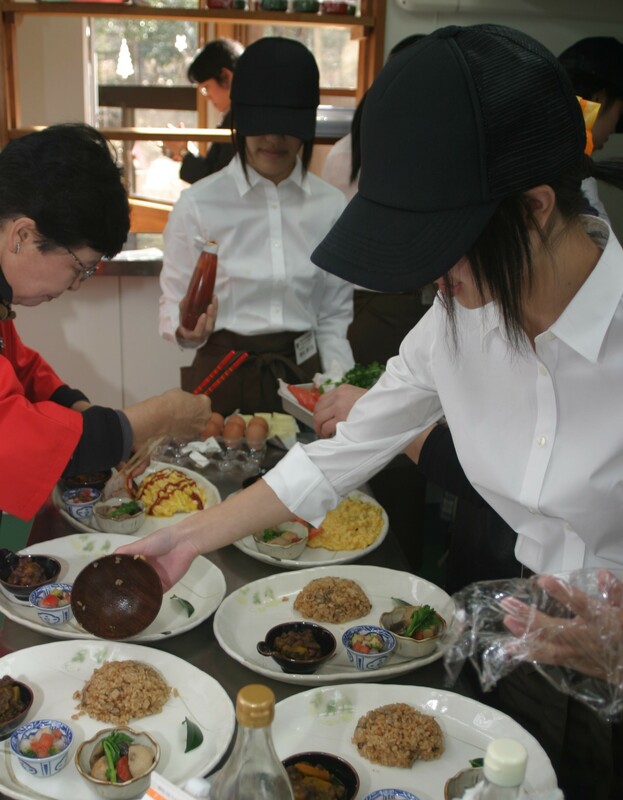 The students of Yokaichi-Minami Agricultural High School in Higashiomi City, on the eastern shore of Lake Biwa, discovered their own value through “food,” the venue of a restaurant, and visualized that value for the community. The students themselves came to the realization that the rice and vegetables that they made every day in the classroom, and the safe and tasty ingredients, such as meat and eggs, obtained from the livestock they raised, should not be taken for granted, but rather were a valuable commodity worthy of delivery beyond school walls. An NPO active in the region came to the table, other local individuals joined the project through the NPO network, and school support grew across the region in an effort to make the restaurant a success. At the center of all of this activity were the high school students, the ones who played the main role. With the decreasing birthrate and aging population, the rate of high school consolidation continues to increase as the number of students per classroom dwindles. Omihachiman City, Shiga Prefecture, being no exception, also once considered consolidation. The target: agricultural high schools. When the idea was first raised to consolidate these schools into regular schools, it was Ayako Fuji, representative of the Flower Project Network of the nonprofit organization “Sai” who put a stop to it. The Flower Project Network, engaged in regional revitalization, first started by taking a look at the current state of agricultural high schools. Tours of the local agricultural high schools bore witness to students who mastered skills while growing crops on a farm, and who then opened small markets to sell produce and processed foods, creating ties and connections with local citizens. Plagued with doubts about the reasoning behind why such places of learning for students key to the regional community in the 21st century were to be eliminated, Ms. Fujii pondered with her colleagues at the Sai Flower Project about what could be done. The conclusion was drawn to make an appeal at the next prefectural assembly: agricultural high school students played a key role in the region and were a presence the region could not do without. Around that same time, there was talk of a private subsidy program. Ms. Fujii immediately discussed this program with the teachers of the agricultural high school. The teachers, however, were well aware of the school’s fragile existence, and the conversation did not continue as far as taking the gifts of the students beyond the school walls. 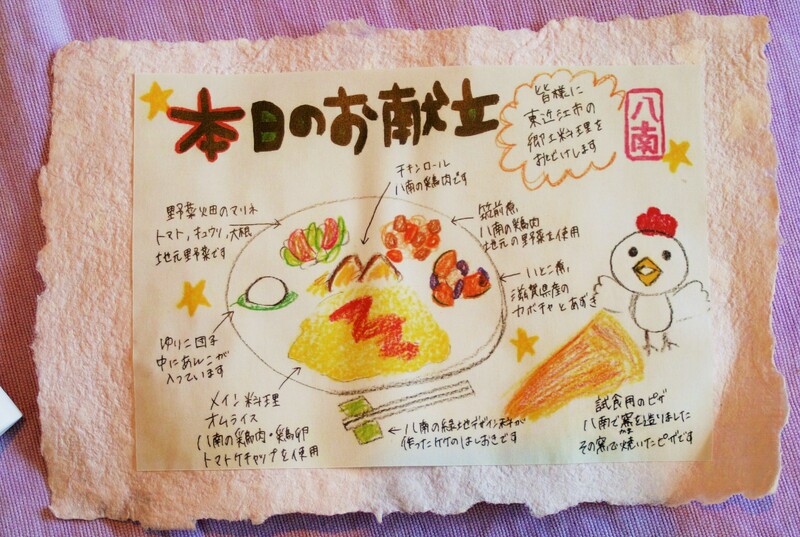 Under such circumstances, Ms. Fujii thought it would be good to create something like a high school student restaurant. Taking the lead, Ms. Fujii formed an executive committee and took the high school students and teachers to the famous “Mago no Mise,” the high school student restaurant located in the hometown village of Taki, Mie Prefecture, for study and observation. While fellow travelers were amazed at the accomplishments of the high school students, the reaction of the students upon seeing the high school student restaurant was somewhat surprising. “This restaurant is nice, but if we opened a restaurant we could create a completely different menu that would taste even better!” And so the conversation began. These students who had each and every day made their own ingredients by hand at the agricultural high school must have intuitively known that, with attention to detail in the ingredients, their restaurant would be second to none. It was not “We can do this too!” but rather “We can do this even better!” This feeling lit a fire in the students. The students’ subsequent actions were remarkable. Discussions started from the bus trip home. What can we make? Let’s take on the challenge of a Christmas restaurant! And the talk went on and on. Ms. Fujii and the executive committee offered consultation support, such as pinpointing what the students had to offer, and held meeting after meeting, following the initiative of the students. Ms. Fujii happily recalls the time. “The stage was set. Discussions advanced and the students took the lead. We didn’t have to say a thing. They just thrusted their way forward.” In their efforts to learn about hospitality from a professional, the students received guidance from a hotelier, and proceeded to prepare for opening day. Along the way, more transformations occurred. When the time came to create the menu, those students who were timid in the beginning were now independent and proactive. Additionally, whereas discussions on the high school student restaurant had previously been a part of class work and initially took place in a food distribution course in the high school, now various other persons in the school became involved. The students in the Art Department were put in charge of designing the sign that was to serve as the facade of the restaurant, and the Green Space Design Course helped with the table settings and decor inside the restaurant. The Green Space Design Course also built an oven using heat-resistant bricks made by applying Hachiman-gawara (Hachiman tiles), a local industry product, and cooked pizzas. Further, using the local purple root (Lithospermum Root) of Higashiomi City grown in class, the students made dyed textiles and added color to the restaurant in the placemats and coasters. In the end, all courses taught at the agricultural high school took part in the endeavor. The entire student body got involved and the high school became as one, all proceeding forward toward opening day. A student, who sharppened his customer support skill by a expert, is escorting the Governor of Shiga Prefecture to the reserved table. 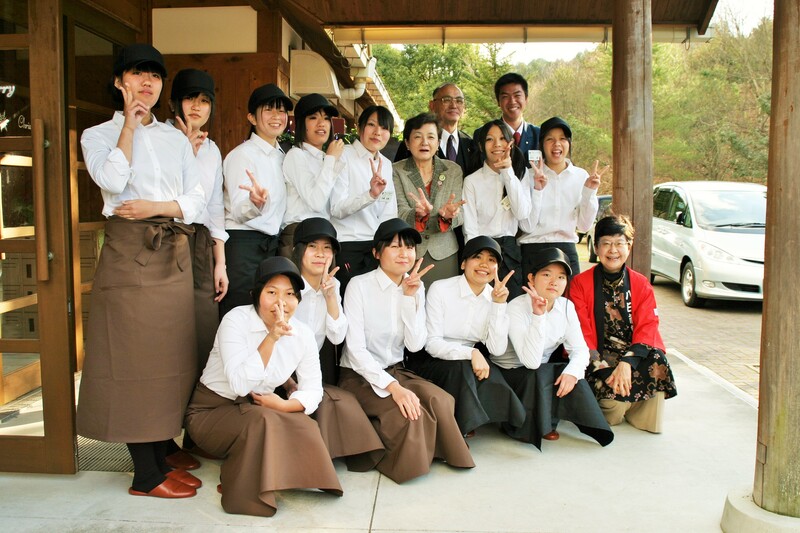 The students who engaged in the endeavor to have fun and create a restaurant at last opened the restaurant “High School Student Restaurant of Local Cuisine” in Aikyonomori located in Higashiomi City for a two-day limited period from December 25 to December 26, 2010. Prior to the opening, the students received nearly 500 reservations, resulting in great success with a full house both days. The prefectural governor, as well as the superintendent of education, received invitations and got the full experience, from hospitality to cuisine, in the restaurant built from scratch by the high school students. The presence of such persons in the restaurant and the patronage from such a variety of people willing to support the community was a real boost for the high school students. The endeavor also gained the attention of the media, making the high school student restaurant of the Shiga agricultural high school a hot topic, increasing the number of prospective students and putting the talk of consolidation to rest. What makes this initiative unique is the great amount of support received through the network of Ms. Fuji, including the Flower Project Network of the NPO Sai. Reflecting on the time, Ms. Fujii commented, “There were various groups and organizations surrounding the high school student restaurant, and it gradually became clear that the involvement of such persons would add to the fun. Simply linking the right people in the right places is all that was needed. Some of the people involved did things I had never even thought of doing, making everything all the more interesting.” Ms. Fujii also spoke about the key to expansion: “If the work is fun, people will enjoy the work even if asked to do it. I believe, in the end, everyone who got involved with the challenge taken on by the high school students had fun making a contribution.” The high school restaurant initiative supported by the local community led to real results, including employment in a local agricultural restaurant for agricultural high school students, and allowed the people involved, including Ms. Fuji, to witness firsthand the full potential of high school students. The menu of the restaurant consisted of various local food products was decided after a series of active discussion. Providing food to local events served as the catalyst for the Mie high school student restaurant, with the community soon realizing what exceptional children were in their midst and the whole town coming together in an effort to draw out the skills of the students. Similarly, one could say that the talk of consolidation served as the catalyst for the Shiga high school restaurant. Yet, Ms. Fujii herself said, “I would never have known about the potential of the (agricultural high school) students if the students themselves had not gone to the Mie restaurant for observation.” Never had she thought that the students would come this far. Ms. Fujii had visited the Mie high school restaurant several times due to its reputation, but never once saw the restaurant through the eyes of such a high school student. Actually visiting the restaurant themselves is what gave the high school students a tangible sense of things, lighting a fire in their hearts. Industrial high schools nationwide, including the agricultural high school addressed here, offer various different paths to creating ties and connections with local citizens through local business and regional development. Yet, without a design that defines who will do the coordinating, what arrangements need to be made, and how to do the funding, success will remain out of grasp. High school students lack experience in working closely with outsiders. Use of private subsidies is also a first for many. The entity being merely a school makes fundraising for such activities difficult. Perhaps we need to bring together strengths and abilities and facilitate local initiatives by encouraging schools from the outside. Then, if an initiative is continually needed in a region, ultimately have the region itself fund the project and support the initiative as a regional endeavor. How to locally support individuals engaged in a food-based primary industry will most likely become increasingly important in the future. For agricultural high schools that are isolated and unaware of their own value, an initiative of providing “food” brings with it possibilities for creating ties and connections with a variety of persons in the community, as in thˆe high school student restaurant. In the case of the restaurant, it is important to note that success was achieved as a result of funding and organizational preparations as well as the full utilization of the network provided by the NPO. Such support is key to the expansion of such initiatives in the future. Lastly, we cannot overlook the efforts made by the NPO: the NPO created an opportunity that charged up and motivated the students and, while continually providing support, utilized a network to connect the driving force generated by the students with various local resources.